Exactly one year ago, SZA had officially made it. Praised as the voice of a generation, the singer's debut studio album, Ctrl, explored the complexities of adulthood and modern romance through the lens of the Instagram generation. Ctrl premiered at No. 3 on the Billboard charts, went platinum and helped SZA (pronounced Sizza) become the 2018 Grammys' most-nominated female performer. But with new peaks of professional success came valleys of personal turmoil, as the 27-year-old Missouri native continued to wrestle with her newfound celebrity. For two years, SZA delayed Ctrl's release over what she described to The Guardian as a "blinding paralysis brought on by anxiety." 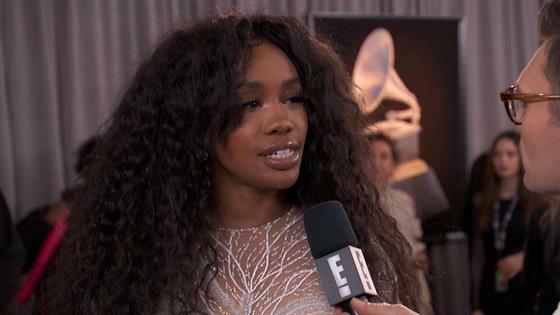 Even walking into the Grammys, SZA told E! News she still felt "deeply nervous" to finally share her music—and by proxy her soul—on such a grand scale. "I'm a really, like, shy person," she shared. "I don't really leave the house or do anything other than what I know. To go against the grain of everything I know in my being was very scary." Despite walking away from the Grammys empty-handed, the snub didn't stifle her momentum. As she explained to Flaunt, "God didn't give me the Grammys, because he knows I would have quit, like ‘I have nothing else to do.'" And to say she hasn't slowed down since Ctrl's release is an understatement. SZA transcended the sub-genre of R&B she carved out for herself by collaborating with radio mainstays like Maroon 5and Cardi B. Kendrick Lamar tapped her for a collaboration on the lead single from the Black Panther soundtrack, "All the Stars," which peaked at No. 7 on the Billboard Hot 100. She also completed a 45-date North American tour in the second half of 2017, followed by performances on Saturday Night Live, several award shows and major music festivals like Coachella. After playing what she considered her "biggest stage to date" in late April, SZA took to social media with an explanation for her seemingly less-than stellar Coachella set. "Every technical difficulty that could've went wrong did," she wrote online. "Every 'friend' I asked to come out bailed on me. Lost my voice completely. Didn't even get a chance to play 'The Weekend.'" Poised to redeem herself on TDE's 30-date Championship Tour, SZA's non-stop year caught up with her when her vocal chords swelled and was forced to take a step back. "This didn't happen overnight," she offered in an explanation to fans on Instagram. "I've been troubleshooting for a while now and usually steroids and pushing through help. They don't this time. I'm not sick my voice just won't f--king work. If I don't pause now I'll be forced to pause permanently." Days later, SZA tweeted (but has since deleted), "My voice is permanently injured... Tonight was the test. That settles that. I jus wanna be left alone my priorities are f--ked up. They been f--ked up. I need space goodbye." Her tune—and luck—turned around, and a June 17 Twitter update said she was recovering from the health crisis and ready to hit the stage at Delaware's Firefly Festival. No matter how many times SZA calls time out on her music career, something brings her back. "My world got so much smaller so fast," she told Flaunt of Ctrl's success. "I have so much to write about. I feel like I'm in a cage. I'm making the best album of my life for this next album and I know that... because it's going to be my last album." A statement that's undoubtedly hard to believe, especially since SZA heads into this Sunday's 2018 BET Awards with four nominations, including Album of the Year. If there's one thing SZA's mastered over the past year, it's keeping us (and probably herself) on our toes.